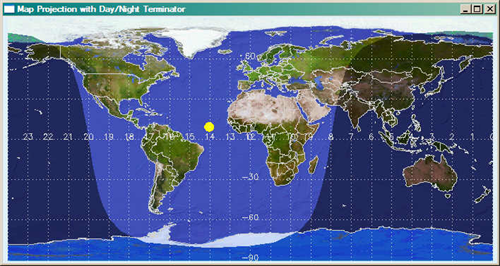 This is a program for viewing a map of the Earth in several different projections with a day/night terminator. Both the Coyote Library and the JHUAPL IDL Library are required to run the program. The spherical geometry problems inherent with working the map projections are not completely solved in this program. The main problem seems to be that if the terminator polygon (represented in the program by the variables lon_terminus and lat_terminus) overlaps the pole regions, then stardard methods for determining if a point is inside or outside a polygon are not reliable. (*All* longitudes are inside the polygon if the polygon overlaps a pole!) In the program, this manifests itself as the sun side of the terminator appearing dark and the night side appearing light. Hence, the FLIPDAY keyword. To some extent, this problem can be eliminated by setting the CENTER_LAT parameter to zero, at least with some map projections. I've thought about forcing it to be zero and forcing you to use well-behaved map projections, but have decided to leave the program the way it is so you can discover the limitations yourself. The longitude, in degrees, of the center of the map, (-180 to 180). The latitude, in degrees, of the center of the map, (-90 to 90). Latitudes other than zero can often cause problems with the terminator polygon "spilling over" into the wrong areas of the map. cgTeminatorMap, 0, 90.0, MAP_PROJECTION=4, time="Thu Apr 13 08:49:34 2006"
Set this keyword to a named variable to return a 24-bit color image of the final result. Either the number or the name of one of the following map projection types. The name of the output filename. Used only if the PS or PNG keywords are set. If this keyword is set, a PNG file is created from a PostScript intermediary file. ImageMagick must be installed for this option not to cause an error. Set this keyword to create a PostScript file of the terminator image. If not specified, the current day and time (from SYSTIME) is used. Copyright (c) 2006-2011, Fanning Software Consulting, Inc. Written by David W. Fanning, April 12, 2006. Updated to use Coyote Graphics, 6 September 2011. DWF. Algorithm reworked and improved. 13 November 2011. DWF. The map projection order seems to have gotten itself scrambled. Fixed. 1 March 2012. DWF.